General Clamp Industries, Inc. is one of a group of companies active in the lifting industry since 1965. We have over 40 years of successful service in the lifting and material handling industry. Beginning in 1965 as an inspection contractor, we quickly grew until today where we are one of three related companies, all active in the lifting field. General Clamp Industries, Inc. manufactures SUPERCLAMPTM beam and girder clamps and trolleys. This unique line of patented under hook lifting accessories is designed around safety and ease of use. SUPERCLAMP incorporates a left and right hand threaded adjustment bar for fast installation and removal. The design ensures that each clamp need be hand tightened only... no tools required. General Clamp Industries, Inc. also manufactures the only American made fully adjustable one piece beam trolley. The SUPERCLAMP A, B, and BA series of trolleys requires no tools or spacers to be safely installed on the beam flange. Many of our standard clamp and trolley models are approved for personnel use as PFAS Anchorage points. General Clamp Industries, Inc. is conscious of its responsibility to industry and workers, and we ensure that all engineering, design and manufacture is carried out to exacting quality standards and in strict accordance with all regulations. We can guarantee top quality products because they are all made in the U.S.A. with rust resistant A-588 Steel. 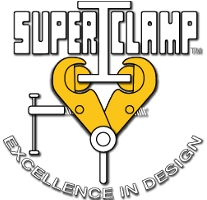 SUPERCLAMP products are certified to meet or exceed all existing state and federal codes, and each unit is load tested prior to shipping. Our sister companies, United States Crane, Inc. and United States Crane Certification Bureau, Inc. are also directly involved in the lifting and hoisting industry. United States Crane, Inc. manufacturers a line of Personnel Lifting Platforms under the trade name SUPERCAGETM. SUPERCAGE is available in three basic configurations; as a Suspended Platform; as a Direct Fixed Attachment Platform; and a ForkLift Platform. United States Crane, Inc. also specializes in the design, manufacture and rebuilding of mobile and tower crane and derrick booms. With over 40 years of experience in this field and a corporate mission for quality and safety, United States Crane is the leader in this field. United States Crane Certification Bureau, Inc. provides crane and boom inspections for safety, preventative maintenance, OSHA certification, and accident investigation purposes. Our qualified personnel are often called upon to provide expert witness testimony in accident investigations and court proceedings. In addition to these services, we provide operator training and certification. Over the past 40 years United States Crane has developed a reputation for quality, service and safety in all our operations and products. Our commitment to safety and customer satisfaction includes maintaining full and complete insurance coverage. General Clamp Industries, Inc. is part of a truly integrated American owner group of companies focused on meeting the exact needs of the lifting industry.